Summary: In near future, disaster strikes earth, where elements are being sucked into a different dimension. Now it's up to the element hunters to bring them back to earth. 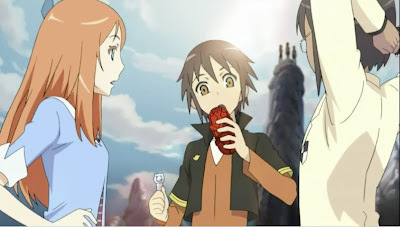 Personal comments: A cheesy concept, a cheesy plot, and some cheesy art work, add in some cheesy conversations, mix with some bad voice acting, this is the recipe for the anime Element Hunters. There's bad, there's terrible, there's horrendous, then there's Element Hunters. I don't think I've ever seen an anime this horrible. Seriously, aside from the opening theme song, I cannot find a single thing that is good from this anime. This is one anime doesn't even worth the electricity that you would use to try to download it. After reading all these, if you still want to watch it, be my guest. I bet you would wish you had taken my advise. Anyway... can you shed some light on this? Go to my myspace and message me when and if you actually care to find anything about it. Thanks! To be honest, after the first 5 minutes, I quite paying attention because it was terrible. But among the couple of minutes I did pay attention to, I didn't notice any perverted conversations. On top of that, I think it's an educational anime for teaching kids chemistry, I some how doubt they'd put in perverted conversations on purpose. I haven't watched the on in the link you gave me, but I think I can safely say it's the sub group's doing, not the anime's intent. You probably watched the Fabulous sub for Element Hunters. They're joke subs. The show is actually really good. I have no idea what the originator of this blog entry is talking about. The show is getting better, and has some real potential. Obviously, we have different taste in animes. But if you have watched all 19 new series came out this season, I think you would have come to the same conclusion that this one would be on the absolute bottom of the list in terms of quality.